Within the Marxist movement, the word revisionism is used to refer to various ideas, principles and theories that are based on a significant revision of fundamental Marxist premises. 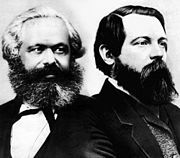 The term is most often used by those Marxists who believe that such revisions are unwarranted and represent a "watering down" or abandonment of Marxism—one such common example is the negation of class struggle. As such, revisionism often carries pejorative connotations and the term has been used by many different factions. It is typically applied to others and rarely as a self-description. By extension, people who view themselves as fighting against revisionism have often self-identified as anti-revisionists. 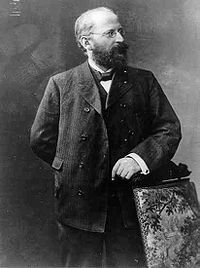 In the late 19th century, revisionism was used to describe democratic socialist writers such as Eduard Bernstein, who sought to revise Karl Marx's ideas about the transition to socialism and claimed that a revolution through force was not necessary to achieve a socialist society. The views of Bernstein gave rise to reformist theory, which asserts that socialism can be achieved through gradual peaceful reforms from within a capitalist system. In the 1920s and 1930s, the International Left Opposition led by Leon Trotsky, which had been expelled from the Communist International, accused the leadership of the Comintern and Soviet Union of revising the internationalist principles of Marxism and Leninism in favor of the aspirations of an elite bureaucratic caste which had come to power in the Soviet Union. The Trotskyists saw the nascent Stalinist bureaucracy as a roadblock on the proletariat's path to world socialist revolution and to the shifting policies of the Comintern, they counterposed the Marxist theory of permanent revolution. Meanwhile, the Soviet authorities labeled the Trotskyists as "revisionists" and eventually expelled them from the Communist Party of the Soviet Union, whereupon the Trotskyists founded their Fourth International. In the 1940s and 1950s within the international communist movement, revisionism was a term used by Marxist-Leninists to describe communists who focused on consumer goods production instead of heavy industry; accepted national differences instead of promoting proletarian internationalism; and encouraged liberal reforms instead of remaining faithful to established doctrine. Revisionism was also one of the charges leveled at Titoists as punishment for their pursuit of a relatively independent communist ideology, amidst a series of post-World War II purges beginning in 1949 in Eastern Europe by the Soviet administration under Stalin. After Stalin's death, a more democratic form of socialism briefly became acceptable in Hungary during Imre Nagy's government (1953–1955) and in Poland during Władysław Gomułka's government, containing ideas that the rest of the Soviet bloc and the Soviet Union itself variously considered revisionist, although neither Nagy nor Gomułka described themselves as revisionists, since to do so would have been self-deprecating. After the 1956 Secret Speech that denounced Stalin, many communist activists, astounded and disheartened by what they saw as the betrayal of Marxist–Leninist principles by the very people who had founded them, resigned from western communist parties in protest. These quitters were sometimes accused of revisionism by those communists who remained in these parties, although some of these same loyalists also shortly thereafter split from the same communist parties in the 1960s to become the New Left indicating that they too were disillusioned by the actions of the Soviet Union by that point in time. Most of those who left in the 1960s started aligning themselves with Mao Zedong as opposed to the Soviet Union. An example was E. P. Thompson's New Reasoner. In the early 1960s, Mao Zedong and the Communist Party of China revived the term revisionism (Chinese: 修正主义 xiūzhèng zhǔyì, "doctrine correction") to attack Nikita Khrushchev and the Soviet Union over various ideological and political issues, as part of the Sino-Soviet split. The Chinese routinely described the Soviets as "modern revisionists" through the 1960s. This usage was copied by the various Maoist groups that split off from communist parties around the world. In 1978, the Sino-Albanian split occurred, which caused Enver Hoxha, the General Secretary of Albania, to also condemn Maoism as revisionist. This caused a split in the Maoist movement, with some following the Albanian Party of Labour's line, most notably the Communist Party of New Zealand and the Communist Party of Canada (Marxist–Leninist). ^ Oxford English Dictionary Revisionism 1. "A policy first put forward in the 1890s by Edward Bernstein (1850–1932) advocating the introduction of socialism through evolution rather than revolution, in opposition to the orthodox view of Marxists; hence a term of abuse used within the communist world for an interpretation of Marxism which is felt to threaten the canonical policy." with the first use in English "1903 Social-Democrat VII. 84 (heading) Revisionism in Germany." ^ [https://www.marxists.org/reference/archive/mao/works/1964/phnycom.htm |MAO TSE-TUNG July 1964 On Khrushchov’s Phoney Communism and Its Historical Lessons for the World: ... the revisionist Khrushchov clique base themselves mainly on the argument that .. class struggle no longer exists. ^ Vgl. Wolfgang Eichhorn: Über Eduard Bernstein. Gegensatz und Berührungspunkte zu Rosa Luxemburg und W. I. Lenin, in: Jahrbuch für Forschungen zur Geschichte der Arbeiterbewegung, No. I/2002. This page was last edited on 15 February 2019, at 12:33 (UTC).